Dharma Durai was directed by Rajini's favourite director Rajasekar and produced by S. Ramanathan and S. Sivaraman under the banner of Rasi Kalamandhir. 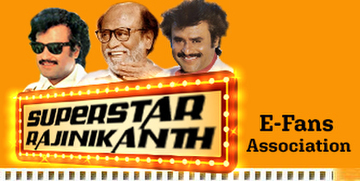 S. Ramanthan is the producer of Rajini's Hindi film "Geraftar". Dharma Durai was remade from Kannada hit film Deva and the hero of that film was Vishnuvardhan. In Telugu version, Mohan Babu was the hero and titled as Ma Inti Katha (Our House Story) which didn't do well as expected . Later Dharmadurai was produced in Tamil and it was superhit. Following this success, it was produced in Hindi by new producer Dilip Kankariya and directed by KC Bokadia. Our Superstar is the hero and it was titled as Tyagi. 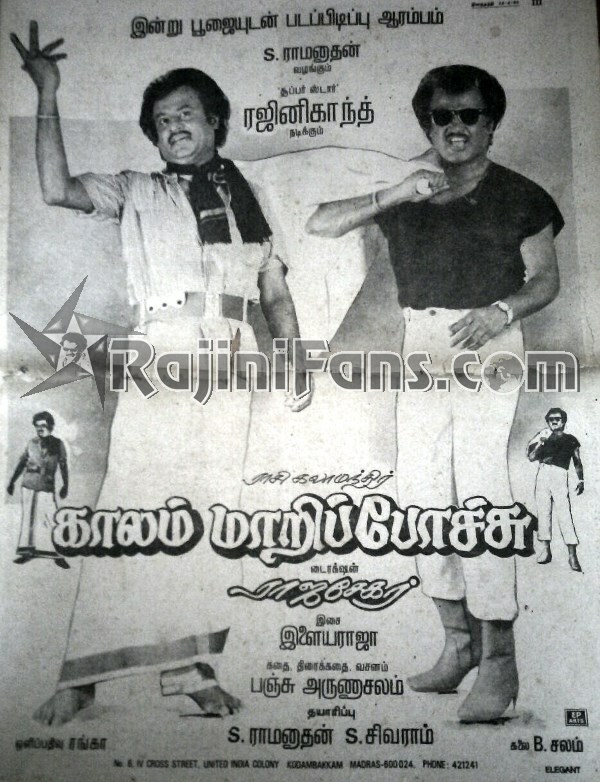 Dharma Durai first paper advertisement was given on 14.4.1990 and it was titled as "Kaalam Maaripochu". They started the shooting with our Superstar, Manjula, Ramesh Aravind and Senthil etc. But later, they dropped the movie and started to shoot the Deva story as Dharma Durai. Superstar was fully involved in the movie and they made several changes to improve the movie quality even after the shooting. Here is an example whereby you will not have seen the scene in Dharma Durai movie. 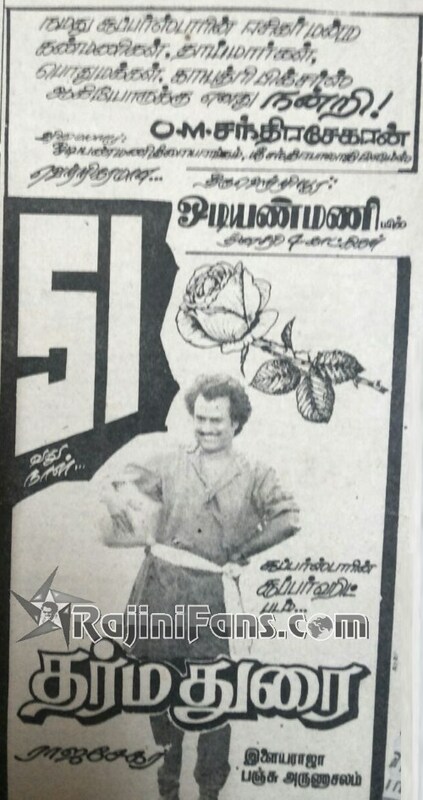 Dharma Duria team decided to release this movie for 1991 Pongal but it was delayed due to unavoidable circumstances. Our Superstar was very keen to release the movie for Pongal and therefore Superstar promised to give whatever supports they needed. Director took as a challenge and worked continuously (non-stop) for 4 days which include shooting, dubbing and re-cording. This was a real achievement and commitment by the whole team. As planned, Dharma Durai was released on Pongal (14.01.1991). At Chennai, it was released at Albert, Annai Abirami, Crown, Kamala and Sri Brinda. The opening day at Tanjore theater was glorious and police could not able to control the crowd and there was big fight between police and fans. Thalapathy Sathyanarayanan traveled to Tanjore and solved the issue. All most every reviews were positive and except some of the routine magazines who prefers to show their nasty side. Kumudam: old wine in new glass and it looks like a 20 years back Bheem Singh movie. Hindu: This is another Aarilirundu Arubadhuvarai. At the end of the year, The Hindu pointed out that Dharma Dorai was one of the highest ran movie of the year 1991. Makkal Kural : They mentioned about Superstar's expression without any speech when he meet his brothers after coming out of the jail. "ORU KATCHIYIL ANDA NAAL SIVAJI (NADIGAL THILAGAM) DARISANAM"
No doubt Dharma Dorai was a clean winner in Pongal releases. This was only one film which celebrated silver jubilee among all above releases. It is a family entertainer and the ladies crowd at all theaters are unimaginable. Chennai area was distributed by HONDA release and they have given good publicity by posters, papers ads etc. The wall poster advertisement was better than paper ad. The wall posters displayed ad for 25, 50, 65, 85, 100 and 175 days. In the papers, they have given for 33 days, 50 days and 100 days only. 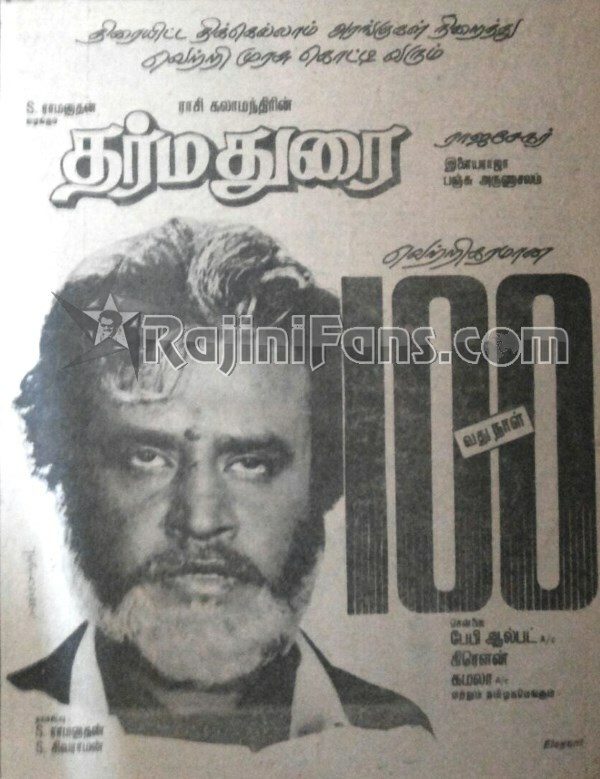 All Rajini fans know that we lost director Rajasekar on the 100th day of Dharma Durai and his sudden demise news was readied as major news in DD-1. Definitely we have to accept that Rajini had lost one of the good directors in his careers. If he is alive, definitely Rajini may have 3 or 4 more Silver Jubilee Movies through him. Just see below the list of C centers theaters Dharma Dorai released during it second releases like 91 Diwali and 92 Pongal. Totally it was released in 61 Theaters and did roaring collections.